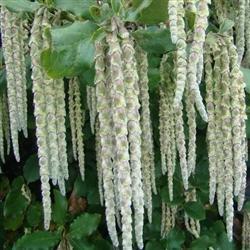 This large shrub or small tree produces long, showy flower tassels up to 12' in length in winter. Its spectacular flower show, combined with sturdy evergreen foliage and a tolerance of pruning make this a popular landscape specimen. It is ideally suited to the coast, which is its natural environment but will tolerate inland planting, where some light or partial shade is recommended. Plant in well draining soil and add some supplemental water. You should expect a mature height of around 12' and a similar spread in a garden situation in Southern California. Horticultural Selection G. elliptica: origin = cuttings (19__) by James Roof, Prairie Creek State Park, Humboldt Co.; intro Saratoga Horticultural Foundation.